This yellow waterproof DryZone Backpack 40L from Lowepro can hold a DSLR with an attached 70-200 f/2.8 lens, two extra lenses, a flash, and accessories. It is made of a lightweight 210D TPU tarpaulin and features a waterproof rating of IPX-6, which indicates that the backpack is protected against high pressure water streams. The backpack features reinforced seams and has a tall, wide-mouth opening that may be folded down and secured with quick-release buckles. For storing your gear, this backpack comes with a removable camera insert that has internal foam dividers. To safely hold your gear, the padded insert has reinforced seams and can be fully closed with a zipper that will not let water in. Nylon-webbed handles sewn onto the top allow you to carry the insert when it is removed from the backpack. Designed to be worn comfortably, the backpack features a foam padded back support and padded adjustable backpack straps. The top grip handle can also be used to carry the backpack. 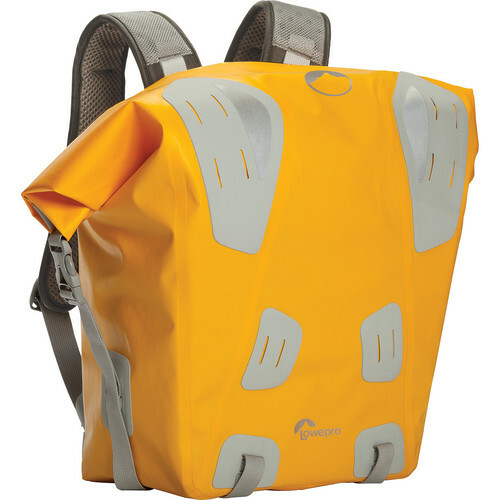 DryZone Backpack 40L is rated 4.0 out of 5 by 15. Rated 5 out of 5 by Jerry B. from Would purchase again when I run out of vertical storage room It is light and fits well! Stores my 70-200 2.8 and T6i camera well vertically with extra room for my other equipment. I purchased this for rain protection during soccer games and waterfowl pictures, I have been very satisfied! Like the color, organizing compartments within and padding on back and shoulder straps! All and all this piece has exceeded my expectations! I haven't had this experience yet, but I believe the way it seals that it would keep gear dry if dropped into water which is a really nice feature if I am correct in my assumption! Rated 4 out of 5 by Otto from Good Rain Protection Backpack I purchased the backpack because I was taking a photo trip to Oregon. It paid off because it rained much of the trip. I doubt it would hold up to submersion under water, but for use in steady rain my gear stayed safe and dry. It is two pieces, the exterior waterproof shell and an interior pouch with room for camera with lens on, another lens and accessories. I was travelling with another backpack so left the interior pouch at home, flattened the pack, and put it in my luggage. Not the easiest to work out of without the interior pouch, but it did allow me to bring my gear and not worry about it getting damaged by water. I could set it down on damp and muddy ground and not worry. I would not recommend it as an everyday photo pack, but for wet conditions it got the job done. Rated 5 out of 5 by Dawn W. from So Far So Good So far so good. We have not had a chance to use it yet. But it is exactly what we were looking for. We are going to Costa Rica in a few weeks and look forward to trying this out.. Thankfully the color is not as bright as I thought it would be and the size seems perfect.. I really like that there is a separate camera bag with compartments on the inside. B&H Photo has been great so far with being able to find what we need. Rated 4 out of 5 by Mbrown from Great Backpack! I live in a temperate rain forest and this bag has saved my camera gear multiple times during the roughest conditions. I love how the backpack comes with a removable camera case, that can hold a camera with a battery pack two lens and space for other accessories! The quality of the bag is top notch and also comfortable to wear! I would recommend it to my friends. Rated 5 out of 5 by Ralph from Good Camera Protection I'll be using this bag to carry a video camera, a microphone set up and a small on camera light. A carbon fiber tripod with a fluid head gets lashed to the outside. I seems to be totally rain proof and splash proof from spray while running in an open boat here in Alaska. Just what I need. Rated 5 out of 5 by Evan from Great for extreme winter use This has been great for cross country skiing and hiking with my camera in snowy and subzero conditions day after day. Its comfortable, built tough and has plenty of padding and room for my 12 length camera, extra lense and accessories. Rated 4 out of 5 by Photo teacher adventurer from Initial look This bag appears to be very stout. It looks great for canoeing especially and hiking through down pours and taking on sea spray. I like that it's a bright color too. Rated 4 out of 5 by Mason from Totally pleased The backpack is comfortable to wear and perfectly sized. I have yet to confirm if it is totally waterproof because,luckily, I have not overturned my kayak. Hi, is this backpack large enough to fit two cameras with lenses attached if there are no other accessories in the bag? I need to carry one Canon 70D with an attached 18-250mm lens and one Canon T3 with an attached 70-300mm lens. The only other items I will need to carry are extra batteries and memory cards.Thanks. If dropped in the water, will this bag float? I put 5.4 Kg camera equipment's and sealed it with air and it float on sea near phi phi island (I had to swim to get to maya bay)in Thailand. but make sure to keep enough air inside of the bag. I was wondering if this pack is large enough to sufficiently fit a Sony Nex-VG20 with the 18-200 lens attached to camera? It's difficult to tell from the video and photos whether it would fit in depth. If the manufactures specs/ are correct at 12.6 inches deep, then it should. The Sony NEX-VG20 will only fit in the Lowepro DryZone Backpack 40L with the lens not attached.